Find out more about North West London sustainability and transformation partnership (STP) including details of its population size, constituent organisations and priorities. Focusing on prevention – more support for people with diabetes onto manage their conditions; tackling alcohol misuse reducing attendances at A&E; investing in early diagnosis of dementia; and 200 lives a year being saved by detecting illnesses like cancer earlier. Big improvements in primary care by increasing out of hours and weekend appointments, and bringing in additional workforce like clinical pharmacists into GP surgeries. By March 2019, patients who want to will be able to have virtual GP Skype appointments. 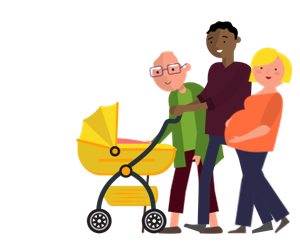 Enhanced home care to support older people in the place they live, including rapid assessment at time of need supported by the speedy implementation of the right care package. A 24/7 pathway in North West London for those in a mental health crisis – this includes a 24-hour telephone line staffed by clinical specialists and crisis teams to support people in their homes day and night. The following organisations are part of North West London STP. For individual contact details for these organisations, please see the NHS website.